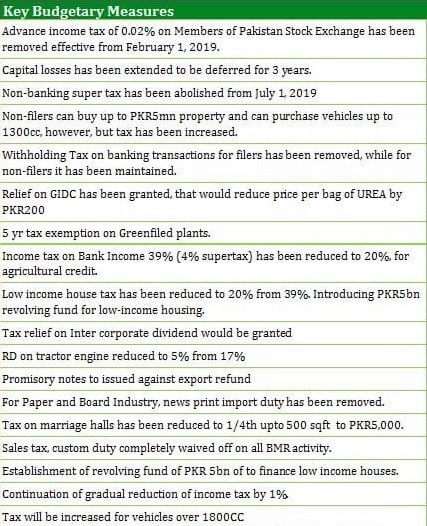 Here's an excerpt of Moody's report on the immediate downsides of the measures announced by Umar on January 23, 2019: “We expect the deficit to widen to 6% of GDP in fiscal 2019 because revenue growth is likely to be below government projections, given slower economic growth and the new revenue-based incentives, before gradually narrowing to 5% of GDP by fiscal 2021 as the economy picks up. While we believe the government remains committed to fiscal consolidation, a wider for longer deficit could raise questions over the credibility of its fiscal policy." Remittances from Pakistan diaspora rose by 10% year on year to $10.71 billion in the first half of fiscal 2019, while goods imports slowed sharply to around 3% year on year as non-energy imports contracted. Moody's expects "the current-account deficit to narrow to 4.7% of GDP in fiscal 2019 and to 4.2% in fiscal 2020 from 6.1% in fiscal 2018, it will remain sizable and wider than in 2013-16, driving Pakistan’s external financing needs. The government has secured $12 billion in financing from Saudi Arabia and the United Arab Emirates – in each case amounting to $6 billion and divided equally between deposits and deferred oil payments – which is likely to largely cover the country’s net financing needs for fiscal 2019". Beyond fiscal 2019, however, a net financing gap remains large because of the still sizable current-account deficit. Pakistan remains in negotiations with the International Monetary Fund over a new program that would provide a stable additional source of external financing, as well as technical support and assistance on macroeconomic rebalancing and structural reform policies. Can Pakistan Avoid Recurring Balance of Payment Crisis? The devaluation of PKR is the main driver of the reduction in the current account deficit. It is already having an impact on slowing the growth of imports. Pakistani exports should hopefully become more competitive and export growth restarted. At 140 to USD, the PKR is around fair value, but East Asia developed its export industries on the back of undervalued currencies, a strategy Pakistan should copy. Keeping the currency weak suppresses imports while boosting exports and promotes investment over consumption. Another factor in estimates of the budget and current account deficits is that they are based on an outdated GDP measurement. GDP has not been rebased since 2006, and is likely 15-20% underestimated, a more accurate GDP would reduce t he budget deficit and current account account deficits as percent of GDP to more manageable numbers. Back in 2017 the government claimed they were in the process of rebasing, with the target to complete by end of 2018. Don't know where that stands now. Now the US has appointed Mr Khalilzad to oversee a peaceful reconciliation with the “terrorist” Taliban under the stewardship of none other than the “double-dealing” Pakistanis. Is this about turn a manifestation of the failure of US strategy, and by corollary a success of Pakistan, in Afghanistan? Interestingly, both the US and Pakistan are playing it cool. The US has not offered any mea culpa for two decades of misplaced concreteness and the Pakistanis are not crowing about being center stage again. Instead, both are working hand in hand to protect their respective national security interests. For its help in bringing the Taliban to the table and leaning on them to facilitate a respectable and orderly exit from Afghanistan in the next 18 months, the US has now channeled $12b to Pakistan via its strategic partners in Riyadh and Abu Dhabi. Indeed, the main reason for Pakistan’s new government’s delay in clutching at an IMF program was to clinch such a strategic “deal” with the US first so that the IMF would eventually soften its conditions for a bail out. @Ahmed. It is well known Najam Sethi is not a fan of Imran Khan. He would hate to give Imran Khan any credit for any accomplishment. He is giving this accomplishment of Imran Khan a spin in order to minimize his achievement. In other words, he would much rather give the credit to US influence than to Imran Khan's influence. In addition, Mr. Sethi's timeline is way off. Saudi Arabia promised help way before Trump asked Pakistan's help in December. Qatar is not on good terms with the US and is unlikely to listen to the US at this time. This leaves only Abu Dhabi, which is as likely to listen to Saudi Arabia as to the US, if they can't make their own decision.. As far as "---- the main reason for Pakistan’s new government’s delay in clutching at an IMF program was to clinch such a strategic “deal” with the US first so that the IMF would eventually soften its conditions for a bail out." I haven't heard a more stupid statement regarding Pakistan's dealings with the IMF. The actual situation is the complete opposite. The US made it quite clear it was against IMF helping Pakistan and was instrumental in imposing the harsh conditions IMF wanted to impose. That is why Pakistan sought alternate sources of funding, and was successful. If IMF softens its conditions for the bailout, it will be because it, ie, the UDS, failed in preventing Pakistan from obtaining alternate sources of funding. Now it is clear that Lindsay Graham was not on a solo flight. He was speaking of Free Trade Agreement with Pakistan to ensure Pakistan’s cooperation and help Zalmay Khalilzad clinch a deal. First America bought Pakistani dictator’s cooperation with promise of “aid” to go into Afghanistan and now it is offering “aid”, to extricate itself from this mess. As Sethi says, gone are the days when Taliban were terrorists and Pakistan was a double dealing little guy. This seems to be Trump’s pragmatic side. But the establishment side (CIA) is still singing the old song. And alarm bells and sirens are blaring in Bharat Mata! As part of eBRI initiative Pakistan is being offered one of the first 5G network sites by Chinese brothers. Karachi is most likely candidate. Some local vested interests are trying to scuttle but China has launched a pitch in our press to get public support. I wouldnt get carried away with this minor point that the Taliban and US supposedly agreed to. In theory the Taliban claimed that they would not let other terrorist groups use Afghanistan in the future, with the US conceding that in the context of a final deal it would eventually pull out its combat forces. But that does not bind the US from aiding the Afghan government or keeping CIA assets in country with drones, which would be enough to hold the Taliban at bay. In addition, part of any deal would require the Afghan govt and the Taliban to negotiate peace. What would those terms be? At a minimum the Taliban would have to cease-fire for a prolonged period of time to prove they are committed to ending the civil war. How many votes would the Taliban win in an election? Opinion surveys show they have less than 5% support among the people (and all of that is confined to Pashtuns). In addition the US House and Senate both voted overwhelmingly in opposition to any withdrawal, and so none is going to take place, Trump doesnt have the attention span to carry out such a policy, much less negotiate a final deal the Afghan govt agrees to in the next 12 months (after which US elections will paralyze his administration from major actions). Finally, even a US withdrawal would not doom the Afghans. The Afghan communists easily held off the Mujahideen from the Soviet withdrawal in 1989 till 1992 when they lost their Soviet aid with the collapse of the Soviet Union. The US is not going to collapse, and will continue to provide whatever aid needed to keep the Taliban out of Kabul. Finally, if the Taliban violated a cease-fire and tried an all out assault, US B-52's from Qatar and Diego Garcia would chop them to pieces. Don't forget the Taliban were utterly wiped out in 2001 by B-52's, CIA and Special Forces, and the ragtag Northern Alliance militia, no major US ground forces were involved in that fight. Debt concerns relating to the China-Pakistan Economic Corridor (CPEC) projects will begin to recede on the back of improving transparency while political risks have been diminished, says Fitch Solutions. Fitch in its latest report "Industry Trend Analysis - CPEC to Remain a Primary Driver of Pakistan's Construction Industry" states: "We expect debt concerns surrounding CPEC projects to ease after financial details are released. In addition, we believe political risks associated with CPEC projects have diminished since the 2018 Pakistani general election. These factors will reduce overall risk profile of CPEC projects." The report further states that the CPEC will continue to support growth of Pakistan's construction industry in the coming years, aided by China's sustained push on project implementation, as well as warming bilateral relationship between the two countries. Since the implementation of CPEC, a centrepiece of China's Belt and Road Initiative (BRI), in 2013, the mega project has faced numerous challenges resulting in large downside risks to many projects. Despite these challenges, 11 CPEC projects, labelled as early harvest projects, have been completed thus far. Despite significant media and political scrutiny of CPEC, this progress on projects underscores Beijing's improving track record in project implementation and its commitment to infrastructure development in Pakistan. Since the inception of CPEC, projects have shown good progress in terms of execution; a total of 3,240MW of capacity had been added to the Pakistan's national grid, accounting for more than 11% of the total installed capacity in the country. Also, the 392KM Multan to Sukkur section of the Peshawar-Karachi Motorway, a key CPEC project which broke ground in August 2016, is currently more than 80% complete and is slated for completion by August 2019. As such, Fitch believes that continued Chinese involvement in the Pakistani construction market will provide a positive upside in terms of timeliness and execution, and will continue to boost growth of the construction industry in the near future. The report further states that debt concerns relating to CPEC projects will begin to recede on the back of improving transparency. In December 2018, reports relating to the Pakistani government's debt to China had been circulating in the media, with this amount purportedly to be in the region of $40 billion. Pakistan's Ministry of Planning, Development and Reform and the Embassy of China in Pakistan have since released statements clarifying the total value of the aforementioned 22 early harvest CPEC projects completed and under construction to be around $18.9 billion, of which around $6 billion of loans, representing 32% of total value, were provided by the Chinese government and will be repaid over 20-25 years from 2021 at an interest rate of around 2%. From these statements, it has been noted an improvement in terms of transparency of CPEC projects, with China also providing a breakdown of the type of financing and the estimated investment for each CPEC project. Fitch believes such a move is a welcoming sign for Pakistan's construction industry as calls for a greater level of transparency over CPEC projects are now being addressed by authorities. This would in turn provide more comfort for potential investors to Pakistan's construction industry. Furthermore, it has been believed this improved transparency will aid Pakistan's efforts in renegotiation for an IMF bailout deal which, if secured, could provide its ailing economy with much needed economic relief. In the meantime, it has maintained the real growth rate of Pakistan's construction industry to average at 8.9% over the next 5 years. "We will adjust our forecasts to account possible positive ripple effects across the economy, including the construction industry, in the event an IMF bailout is secured." Fitch believes political risks associated with CPEC projects have diminished. "Previously, we note that the transition in power from Pakistan Muslim League (Nawaz) to Pakistan Tehreek-e-Insaf (PTI) posed a downside risk to the Pakistani construction industry as new Prime Minister Imran Khan pledged to review Chinese-backed projects, which could potentially have led to project delays and cancellations. However, the political situation in Pakistan has since stabilised and Prime Minister Imran Khan has demonstrated willingness to cooperate with China on multiple issues including CPEC. "As such, we are in the view that downside risks stemming from political uncertainty are diminishing, and bilateral projects spearheaded by CPEC, will receive a boost in terms of policy implementation and project continuity," maintained the report. Riaz sab, how much money you suggest ordinary Pakistanis like me should invest in Pakistan Banao certificates. The yeilds are very attractive. What do you feel about risks? Anon: "The yeilds are very attractive. What do you feel about risks?" Pakistan's government debt is currently rated several notches below investment grade by international rating agencies. Pakistan's bonds are therefore equivalent to high-yield corporate bonds traded on international debt markets. Such bonds fetch in excess of 7% annual return. If you want high return , you can invest in these bonds. The only reason you should buy Pakistan Banao Certificates (PBC) is to help your home country. The plan is failing. More bombs and boots haven’t brought victory any closer. Tens of thousands of Afghan civilians have been killed, maimed and traumatized. Millions of people are internally displaced or are refugees in Iran and Pakistan. Poppy cultivation is up four times over 2002. Despite years of economic and military aid, Afghanistan remains one of the least developed countries in the world. Afghan security forces, which were supposed to take over from NATO troops, have lost a staggering 45,000 soldiers in battle since 2014 and can’t fill their recruitment targets. Mr. Trump’s administration — which announced it would withdraw 7,000 troops but has yet to do so — is now negotiating with the Taliban, talks that are scheduled to continue this month. That’s a promising sign of a much-needed acknowledgment of reality. It is time to face the cruel truth that at best, the war is deadlocked, and at worst, it is hopeless. The initial American objective — bringing Bin Laden to justice — has been achieved. And subsequent objectives, to build an Afghan government that can stand on its own, protect the population and fight off its enemies, may not be achievable, and certainly aren’t achievable without resources the United States is unwilling to invest. That retrenchment needs to start where it all began: Afghanistan, which has remained for more than 17 years an open-ended war without an exit strategy or a focused target. At the peak of NATO involvement in 2011, around the time Bin Laden was killed in Pakistan, there were more than 130,000 soldiers from 50 nations fighting the Taliban and building up the Afghan national army, so it could stand on its own. This page has been supportive of the war in Afghanistan since it began. We criticized NATO countries in Europe for not sending enough soldiers. And we were critical of the Bush administration for its lack of postwar planning and for diverting resources to the war in Iraq. Events have shown us to have been overly optimistic regarding the elected Afghan government, though we were rightly critical of its deep dysfunction. We have raised concerns about military tactics that cost civilians their lives and been skeptical of the Pentagon’s relentlessly rosy assessments of the progress made and the likelihood of success. #Pakistan’s #trade #deficit down by more than $2b. Pakistan’s trade deficit was recorded at $ 19.26 billion with a 9.66 % reduction during the first seven months of the ongoing fiscal year 2018-19. #Exports: $13.23 billion, #Imports $ 32.49 billion. Pakistan’s trade deficit was recorded at $ 19.26 billion with a 9.66 % reduction during the first seven months of the ongoing fiscal year 2018-19. Pakistan’s exports remained $13.23 billion, while imports recorded at $ 32.49 billion during July to January 2018-19. Trade deficit witnessed more than $2 billion reduction during the said period, according to the Pakistan Bureau of Statistics. Government is expecting $5 billion to 6 billion reduction in the trade gap at the close of the year, said Commerce Secretary Younis Dhaga. The imposition of ban on import of furnace oil and increased in regulatory duties on luxury items is yielding positive results as imports witnessed 5.17 % in first seven months, says Abdul Razaq Daud, the adviser to the prime minister on commerce. The impact of recent rupee depreciation will be witnessed more positive results in exports, he said talking to media in Islamabad. US$ 210.36 million together as against US$ 201.46 million received in January 2018. In addition, the economy is under less pressure today thanks to the decline in oil prices, which has slowed the pace at which Pakistan was running out of foreign exchange reserves. Pakistan’s currency has also dropped by about 30 per cent against the US dollar since late 2017, making the country’s exports more competitive. Still, not everyone shares this more optimistic view of Pakistani prospects. Earlier this month, for example, Standard & Poor’s downgraded Pakistan’s long-term sovereign rating to “B-”, citing diminished growth prospects. “While Pakistan has secured financial aid from bilateral partners to address its immediate external financing needs, we believe that fiscal and external imbalances will remain elevated,” the rating agency said. Some analysts believe it is precisely financial aid from countries such as Saudi Arabia that has kept Islamabad from adopting reform measures that may prove painful in the short run but are necessary for longer-term stability. Saudi Arabia, however, remains a longtime ally of Pakistan. Pakistan’s army provides 15,000 soldiers to protect its royal family in exchange for $5bn annually, according to Mr Nasr. Moreover, there are about 1m Pakistanis working in the kingdom and hundreds of thousands more scattered throughout the United Arab Emirates and Qatar, whose remittances have helped to narrow Pakistan’s current account deficit in recent years. Pakistan has only about $8bn in foreign exchange reserves, enough to last it for about two months. The $14bn Saudi Arabia plans to commit includes $6bn in a loan to beef up liquid foreign reserves and in deferred payments for Saudi oil shipments to Pakistan. The remaining $8bn will go towards financing a multibillion-dollar refinery at Gwadar, a coastal city with a deep seaport near the Iranian border, according to senior government officials responsible for monitoring foreign investments in Pakistan. “They [Saudis] need friends now more than at any other time and Pakistan needs investments,” said retired Major General Mahmud Durrani, a former national security adviser. Officials say the Chinese government has also promised a grant of $1 billion for education, health, vocational training, drinking water and poverty alleviation projects over the next three years. Minister for Planning, Development and Reform Makhdum Khusro Bakhtyar said Chinese experts are due to arrive in Islamabad later this month to coordinate socio-economic development under the promised grant. Pakistan's foreign currency exchange remains under severe pressure, despite receiving around $2 billion from China and $4 billion from Saudi Arabia and the United Arab Emirates in commercial loan deposits. SBP reserves stood at $8.2 billion last week, barely enough to cover two months' worth of imports. In the last six years, China has made significant financial contributions to direct investment, soft loans and commercial deposits to help its close ally, Pakistan, overcome severe economic challenges. Under its Belt and Road Initiative, Beijing has invested $19 billion in Pakistan to build and improve road infrastructure and power plants and opened the strategic Arabian Sea port of Gwadar. Beijing has also given Islamabad concessional loans for some projects under what is known as the China-Pakistan Economic Corridor (CPEC). The cooperation deal has created more than 70,000 jobs for Pakistanis and quickly resolved the country's chronic energy crisis. But investments from China had stopped because all major projects under CPEC will be complete by the end of this year. Chinese and Pakistani officials say preparations are under way to launch the next phase of CPEC in coming weeks to construct nine special economic zones across Pakistan. Beijing plans to relocate some of its industries by transferring technology to the new industrial zones to help Islamabad increase its exports to overcome its massive trade deficit and shore up cash reserves. CPEC has "changed the image of Pakistan" and encouraged other countries to invest in the country, notes veteran opposition Senator Mushahid Hussain, who chairs the foreign affairs committee of the upper house of parliament. He praised China for being the only country to bring unprecedented, massive investments to Pakistan five years ago when other nations were reluctant to do so due to terrorism-related security concerns and political considerations. Saudi Arabia is the one powerful ally on which Pakistan has always been able to rely. The two countries signed a friendship treaty in 1951, just four years after Pakistan was founded as a Muslim homeland. Ever since then, the Saudi monarchy has come to its aid. During earthquakes and refugee influxes, periods of financial distress and diplomatic isolation, the Saudis have stepped up with loans, political support and free supplies of oil. Millions of Pakistanis work in Saudi Arabia, sending home close to $5 billion in remittances each year. The monarchy has also built a majestic mosque in Islamabad, named after the late Saudi King Faisal, and has long supported seminaries and groups that abetted the rise of ultraconservative Sunni Islam here. In the past several years, the relationship cooled over the issue of Yemen. Saudi Arabia intervened militarily in 2015 when Yemen’s president was toppled by the Houthi minority movement, and Pakistan remained neutral instead of contributing troops. But this week, Pakistani officials said Mohammed’s visit sent an important sign of revived amity between the two Islamic republics. Saudi Arabia’s Crown Prince Mohammed bin Salman said his country signed so-called memorandums of understanding worth $20 billion of investment in Pakistan. “We are creating a great future for Saudi Arabia and Pakistan,” Prince Mohammed said at a reception by Prime Minister Imran Khan after the kingdom’s de facto ruler reached Islamabad on Sunday on a two-day trip. The two nations signed investments deals in energy and agriculture sector including setting up a $10 billion oil refinery in southwestern city of Gwadar. Prince Mohammed’s investment plans may help premier Khan’s efforts to revive an economy hurt by widening current account and fiscal deficits. Saudi Arabia has already given a $3 billion loan to Pakistan, while the United Arab Emirates provided $1 billion as part of its $3 billion balance of payment support that helped south Asia’s second biggest economy avert a financial crisis. The Saudi support comes as Pakistan has stalled in its negotiations with the International Monetary Fund over proposed reforms, though Finance Minister Asad Umar said this month the nation is close to signing a bailout package to help ease its balance-of-payments crisis and boost dwindling foreign reserves. The visit comes as Khan was one of the few prominent foreign dignitaries who attended the Future Investment Initiative in Riyadh last year after it emerged that Jamal Khashoggi, a Saudi critic, was killed inside the kingdom’s consulate in Istanbul. Pakistan publicly supported Saudi Arabia in the wake of global outrage following Khashoggi’s murder. While both nations have been long-time staunch allies, relations took a hit four years ago after Pakistan refused a Saudi request for support in the Yemen conflict. Saudi Arabia has also long been accused of funding and spreading extremist Islamic ideology across Pakistan. Governor of the State Bank of Pakistan Tariq Bajwa has said the country has come out of the financial crisis with the help of friendly countries and the economy has been set on the right path. Speaking at a private university in Lahore on Monday, he said uncertainty in the economy had ended. The government, he said, was on the right path and it was capable of meeting all economic challenges. The governor spoke about the current account deficit, which had hit the economy badly during the current financial year. The current account deficit was the real cause of concern for the new government headed by Prime Minister Imran Khan. Mr Khan visited friendly countries like China, Saudi Arabia, the UAE, Malaysia and Turkey to seek investment and managed to get financial help to bridge the external deficit. Mr Bajwa said a plan had been prepared to eliminate the current account deficit and the work in this regard was in progress. He said the deficit was the biggest hurdle for the country and the government was still negotiating with the International Monetary Fund for a package to minimise it. He said the government had not crossed the limit for borrowing from the SBP. It had borrowed Rs3 trillion from the central bank and returned Rs2tr, he added. Since the beginning of the new financial year, the government has been borrowing from the SBP for budgetary support, while it has retired loans taken from the scheduled banks. It has so far retired about $2.9tr to the scheduled banks. The policy shows the government wants to keep the scheduled banks liquid so the private sector could borrow more from the banking system. According to a latest SBP report, the private sector borrowing has more than doubled from July 1 to Feb 8 to Rs571 billion from Rs264bn in the same period of the last financial year. The SBP governor said the cases involving Rs600bn were pending in banking courts. He said capacity building was being developed to deal with the huge number of pending cases and for their quick decisions. He said the cases must be decided quickly so that the banks could use the money involved in litigation. Mr Bajwa said the SBP had offered to bear expenses of training of judges to help the courts decide the pending cases urgently. He said the policy to depreciate the rupee had been adopted to reduce the trade deficit, which was the main reason for high current account deficit. Pakistani Mini Invasion of China?